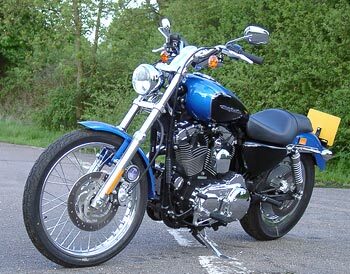 The Harley-Davidson Sportster was first launched way back in 1957, and I hasten to add before I was even born! 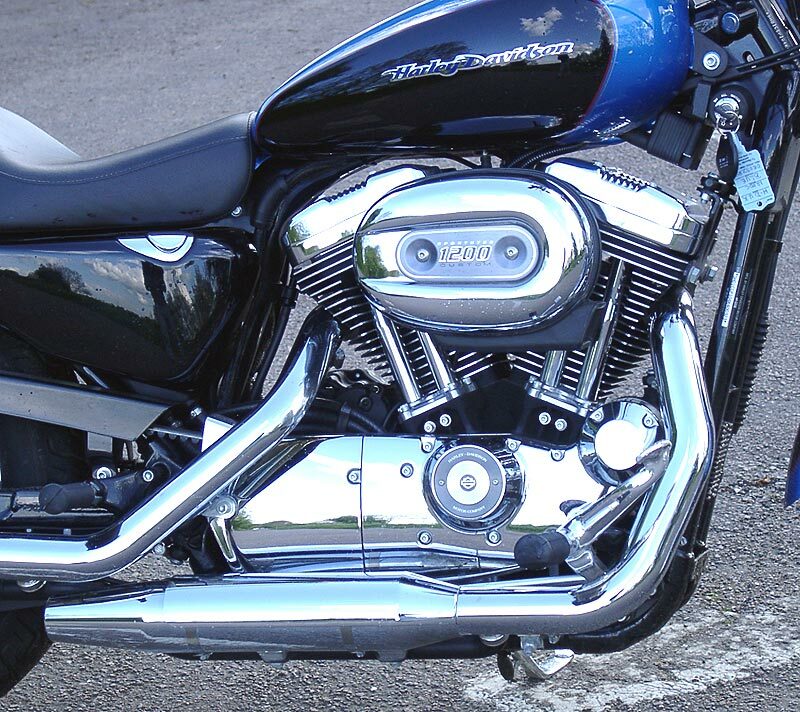 Over the years approximately 787,000 Sportsters have been produced in an array of styles and specifications. 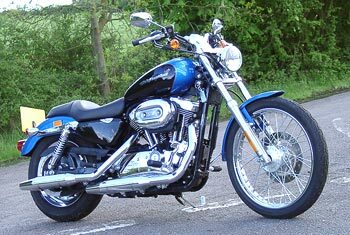 Some years ago I actually owned a Sportster, an 883 Hugger from 1988, it was then that I vowed never to have another! 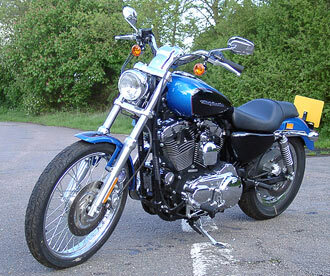 The Sportster range has undergone many changes since it was first introduced, on average every four to five years something was changed or re-designed. All these little things make up to what had become a better bike, and the Sportster accounted for nearly 20% of all Harleys sold. So this year, in Harleys 101st year they have made even more changes to the Sportster range, firstly by cutting down the number of variants and secondly by giving it a total make-over and a major redesign. It was with anticipation that I picked up the new Sportster 1200C from Silverstone Harley-Davidson, but it was a shame that during most of the test time it decided to either rain, sleet or hail for the next week or so. Never afraid of riding in bad weather I set off on my first ride, the only thing on my mind was cleaning all that chrome when I got back! About 75 percent of Sportsters are sold to first time Harley-Davidson riders, and about 95% of them end up buying another Harley in the future, so it better be a good introduction to Harley ownership. So in Harley-Davidsons eyes it makes complete sense to design and build a better Sportster. With a better bike and better reviews Harley are keen to bring more people to the brand and keep them there, after all they have a fantastic choice of next stage bikes to move up to. 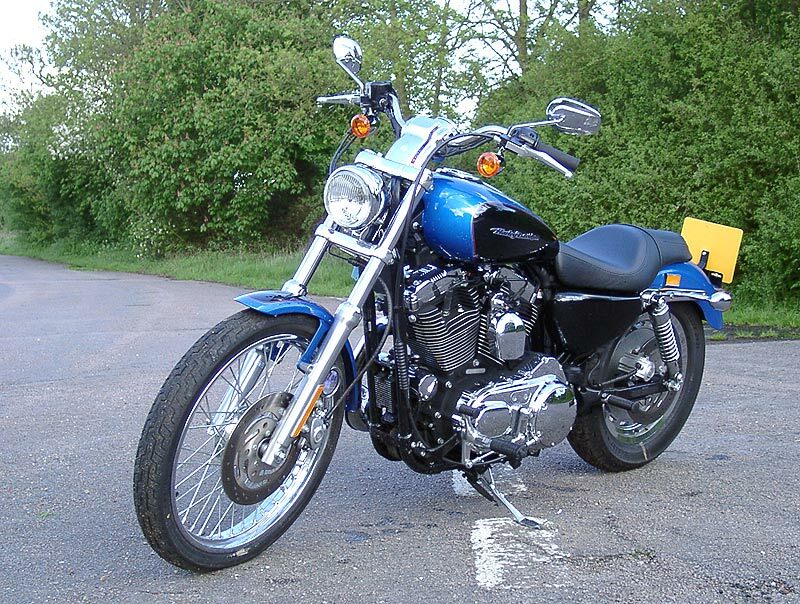 My previous experiences with Sportsters were not at all good, in fact I would go so far as to say that the 883 Hugger I owned was possibly one of the worst bikes I ever had! Vibration, lack of power, bit's falling off due to the vibration, and it suffered from built-in rust for most of the relatively short time I owned it. But the little Sportster did surprise me with it reliability, every time I pressed that starter button it went, never failing to get me where i wanted to go. OK so maybe I had to stop and fix something or find it back up the road, but I could always bolt it back on, it never actually broke! Also when I came to sell it I didn't loose any money on it, unlike the majority of other bikes on the market, that just showed the dedicated following Harleys have. Now I'm not saying that the 2003 or any of the earlier models were bad bikes, quite the contrary, there are no really bad bikes, anything with two wheels is fun whatever it is, but the earlier Sportsters did have some drawbacks. The biggest of all was the vibration, this transmitted itself via the solid mounted engine right through the frame and controls and up to the rider, not at all comfortable or relaxing for any sort of distance. But for 2004 the first thing I actually noticed was the near total lack of vibration when I rode the new bike. The latest re-design still maintains its traditional narrow feel of the stripped down Harley, a skinny 21" front wheel and the lowered look at the rear on the 1200C carrys on the tradition into the next generation of Sportsters. 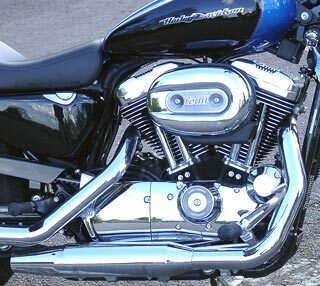 So what's changed, why is it now so nice to ride and nothing like my old 883 Hugger? Well the two major changes to this bike, and the other Sportsters are the new motor and the totally re-designed frame. The new frame was designed to carry the Buell 1200 V-Twin, so Harley did just that and matched it with the 1200 from Buell to give the Sportster more power and a smoother delivery for better riding, and all day cruising capability. Basically the motor is identical to the Buell, just a few minor exceptions for torque and ridability, but in essence they are the same. The other major departure from all the previous Sportsters is that the new Buell derived engine an the transmission are now rubber-mounted to the frame. 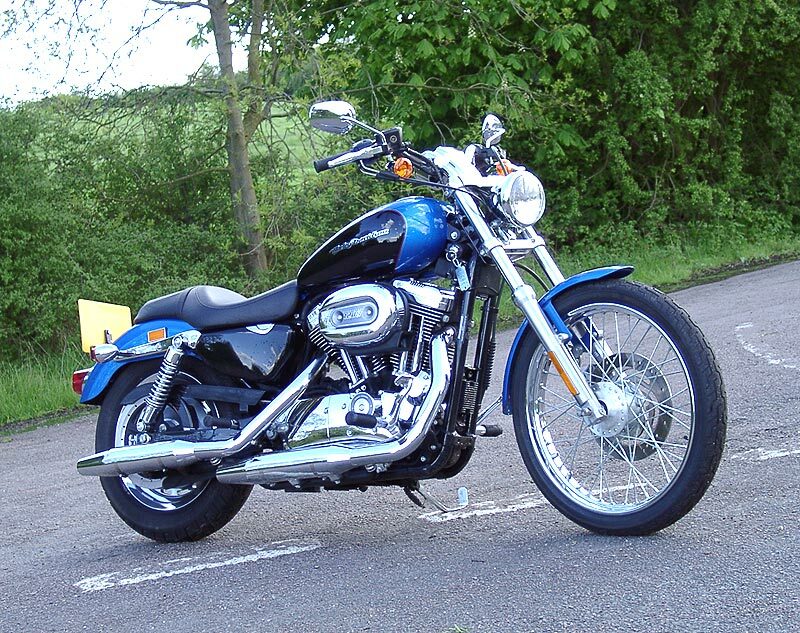 Harley have rubber mounted most things over the years, so the technology and experience they have gained from doing the other bikes was utilised on the 2004 Sportster. The designers have come up with a system using rubber isolator blocks with differing degrees of stiffness, this gives just the right combination of vibration damping for both comfort and handling. There are, in addition to the isolator rubbers, three further stabiliser link bars with rubber mounts which have been designed to let the engine move fore and aft but still keep the sideways movement to a minimum. Without the vibration you can now ride this bike all day and not feel a thing, in fact you can push it so much further than any of the previous Sportsters. Riding the new bike is now a total pleasure, gone are the nasty vibes and lack of power, what you have now is a bike that is bang up to date and will attract a whole host of new Harley riders. These numerous improvements incorporated into the new engine really help it keep up with the demands of the rider, changes such as piston oiling jets, increased oil capacity, and larger cooling fins all work together to keep the operating temperatures within their limits. Other modifications to the engine include lighter pistons and con-rods, a new crankshaft speed sensor managing engine timing, new ported cylinder heads, re-designed camshafts, new two-piece rocker box covers and a 9.7:1 compression ratio. Put all these changes together and what you have as a result is 79 lb-ft of torque at 3,500 rpm, and 70 bhp at the 6,000 rpm redline, a huge difference from Sportsters of old! To look at the 1200C is quite stunning, the new engine looks great with its black powder coated cases, cylinders and heads, they highlight the polished fins and all that chrome I had to clean about 4 times! On another front the traditional Sportster balance pipe has at last been moved. This use to hide a large part of the engine from view, now this has been replaced by a new version similar to its big brothers, now hidden behind the exhaust can. With this increase in space Harley have taking advantage and redesigned the chrome air cleaner adding a new Sportster 1200 badge. Harley have also upgraded the brakes to Nissin 4 pot calipers, these do a good job of hauling up the 1200C with surprisingly little effort on the riders part. 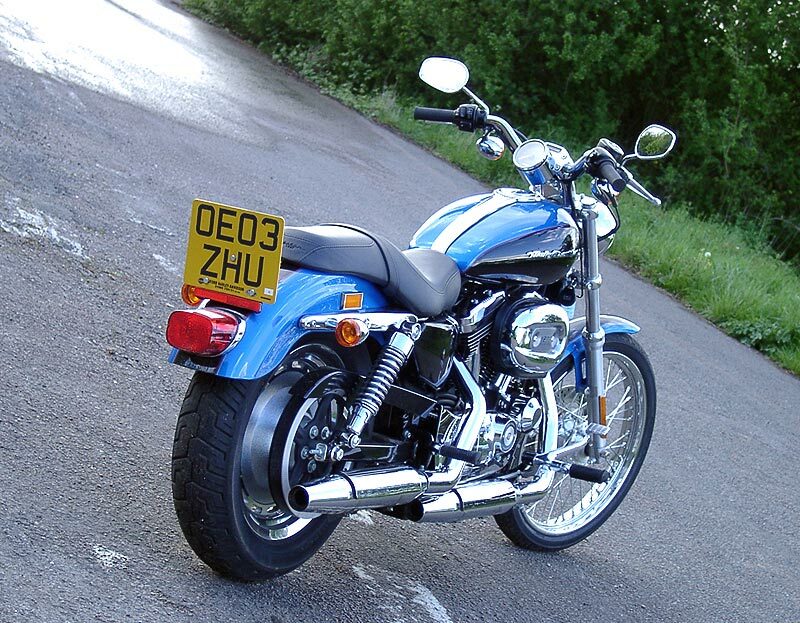 The Sportster 1200C will appeal to many riders, with a seat height of only 590mm shorter riders will have no trouble. The seating and riding position is comfortable even at fairly high cruising speeds, with the oil tank now reshaped and fitted with a flush oil cap the seating is even more comfortable that nefore due to the narrower riding position. Riding the new 1200C is now exciting, something I would never ever have said about the past Sportsters! The overall handling of the Custom is good considering the design, the 21" spoked front wheel and the 16" disc rear. On ordinary roads it takes everything in its stride, come the corners and you have to do a little forward planning due to the lack of ground clearance, but it holds a stable line through the bends and has a great power delivery out of them. What am I talking about, it's a cruiser, a custom bike, it's a Harley-Davidson, this is not what it's all about. But it is with the new Sportster, there are a lot of things you can now do with it, before you would have to think twice, but now it's a whole new ball game! The 1200C was ridden in bad weather and a little good weather, and during the time we had it, it didn't matter what we did or where we rode it, the Sportster 1200C performed exceptionally well. The new engine gives you much more power and torque than any of the earlier Sportsters once it got warmed up, and the new stiffer frame with its rubber mountings made a huge difference. Ride the new bike on any road and you now get the feeling of contact with the surface through the tyres, a feeling you could never say you had from any older model. Gone are the vibrations and the unpredictable handling, you now have a bike that is very capable, has great styling, performs very well and is pretty good value for money. Add to that the inherent resale value of Harley-Davidson motorcycles and we are convinced that this bike will be a winner. This is getting to be something of a habit. I get dragged onto a Harley, very much against my will and usually because I need a bike in a hurry and it’s the only thing available. I go potato-potatoing off down the road and within a few minutes I’m grinning like an idiot and wondering why I don’t do this more often. Harleys have a direct line to the soul, it seems, and the Sportster Custom is no exception. First glance wasn’t too promising. I mean sure, it’s nice enough looking but the skinny front tyre, weedy little single disk and distinct lack of instrumentation boded ill for an exciting ride. And in fairness the ride wasn’t especially exciting. Just enjoyable. Fire the Harley up and it immediately stalls. Remember to use some choke (this being a carburettor version) and it settles into a lumpy but steady tickover. I have no idea what sort of RPM it ticks over at because there is no tachometer. But it’s slow. The riding position is all day comfortable and everything falls to hand and foot in a surprisingly natural way. The lack of footboards is certainly welcome, though the pegs are still a long way further forward than one would normally expect. Kick it into gear and find that the clutch is light and progressive, and that the enormous engine has just the sort of low down grunt you’d expect. So pulling away is a smooth affair, made even smoother by the frankly astonishing rubber engine mountings which do a magnificent job of leaving your fillings in your mouth. 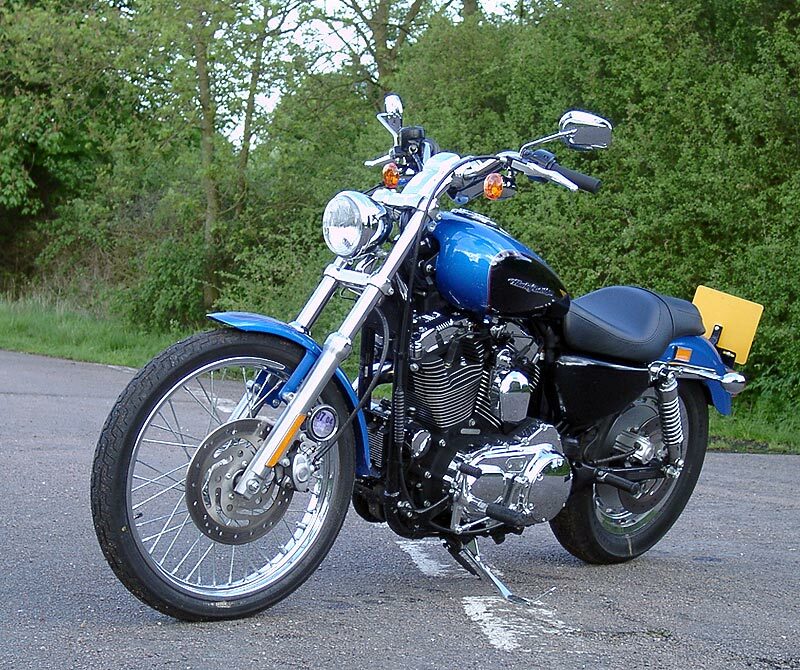 Once on the open road, the Sportster is remarkably quick, holding a stable line through corners, gathering speed quite respectably and generally behaving in a way guaranteed to make the grin just get bigger and bigger. The noise, while muted to meet EU requirements, is very satisfying and the bike talks to you in a way that more modern machinery just doesn’t. Getting into a corner takes a fair amount of effort as befits something this long and solid, but once leant over and back on the gas the whole plot settles down and just glides around. There’s more ground clearance than you’d expect, too. The brakes, while adequate, are unlikely to be breaking many records. But that’s OK – you’ll find yourself being more progressive and riding smoother anyway, and last minute braking will become a thing of the past while you’re on the Sportster. The gearbox is fairly typical Harley Davidson in that it goes into gear reliably every time while managing to both feel and sound as though it won’t. Ah, character. Don’t you just love it? Coming back was an interesting experience because it was dark. Style demands that the Harley Sportster has a tiny little headlight. Function, and presumably immense distances to be travelled in the American Midwest, dictates that the headlight works better than it looks as though it should. Like the rest of the bike, both form and function are satisfied as that tiny little headlight does a credible impersonation of a lighthouse on high beam while dip provides an excellent spread spoiled only by a rather sharp cutoff at the edges of the beam – a result, I suspect, of the very effective lens design. So by the time I brought it back I had added a Harley Davidson Sportster Custom to my list of “Bikes I’d have in the garage if money were no object.” Along with every other Harley I’ve ridden in the past few years. 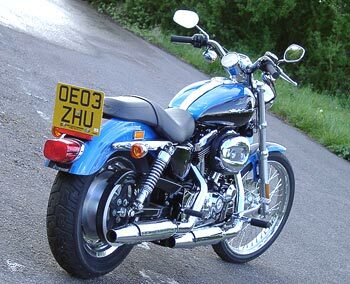 The thing is, though, with the Sportster coming in at around £7000 it’s actually not a money no object bike. It’s just an “if I could get away with having more than one bike” bike. For the price it’s a fantastic bargain. A proper Harley Davidson with some nice modern touches to go alongside the traditional things for the same money as the imitations. Need you ask which I’d recommend?